Photography has ever been part of our lives. You always try to take the best photos of your life with your camera. The best portable camera is your smartphone. In today’s smartphones, you can take stunning photos. It is difficult and always need a computer to share your photos taken by a camera. But, you can easily share your memories if you have a smartphone. Today’s generation love to share their daily activities on social media such as Facebook, Twitter or Google Plus. However, it is not recommendable to do so because someone else may copy your photos from the Internet and use them for a wrong reason. That’s why here I am going to share with you a fantastic software called WonderFox Photo Watermark. In order to protect against your photos from being copied, you can use it. 1 What is WonderFox Photo Watermark? What is WonderFox Photo Watermark? WonderFox Soft, Inc. started in 2009, is a software company specialized in multimedia applications solutions such as video/audio converting and editing applications. As a result of superior quality and support, they have almost 3,000,000 customers all over the world. WonderFox Photo Watermark is a powerful Photo Watermark software with faster speed and high quality! You can use this tool to protect your photos from illegal use, if you are sharing on the Internet. There is more powerful software like Photoshop available for image processing, but Photoshop is not everyone’s cup of tea. WonderFox Photo Watermark makes your work simple like never before. WonderFox Photo Watermark is a watermark program that may be utilized to defend the copyright of your photographs by adding watermarks to photos. 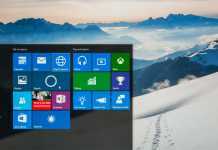 It’s a powerful and practical software that has many helpful features. You can also check Wonderfox DVD Ripper Pro to copy write protected DVDs. Support Text, Image, Frame Watermarks: You can use your own text, logo or frame to use as a watermark on your photos. There are thousands of effects available in each section of watermarking. 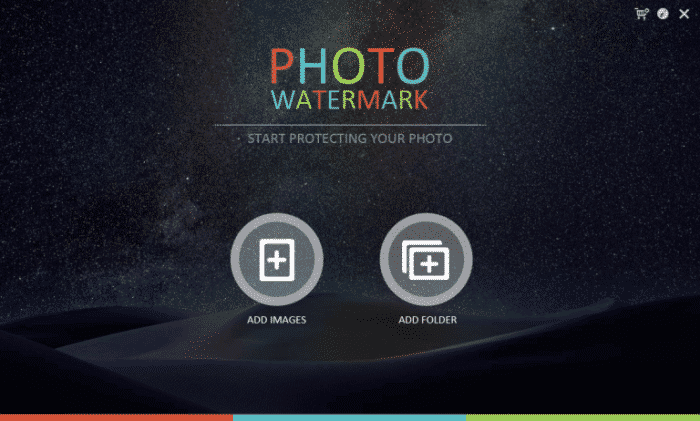 Watermark Template: Suppose, you use a custom designed watermark for everyday usage. You can use that design as a temple to extend the productivity and save your time. Powerful Batch Processing: WonderFox Photo Watermark allows you to watermark 100 Photos in 1 minute. If you have a lot of photos for your project to watermark, then you can use batch processing to save 90% of your time. Free Watermark Materials: There are more than 150 materials to customize your photos and watermark. You can also use the given templates to use it as a watermark. Crop, Resize and Rename: You don’t need to use another tool to Crop, Resize and Rename your photos. It has everything right on the box. It’s not only a watermark software; you can use it as a basic photo editor also. It’s so simple to watermark your photos with WonderFox Photo Watermark. I have divided the task into three sections. When you open the software, you’ll see two options; Add Images and Add Folder. You can use these two buttons to select your desired images for watermarking. Once you selected the images, you can choose Text, Image or Frame as watermark. You can also add cool filters using the Effect tab. If you want, then you can crop, rotate, resize and rename your photos. There is also an option on every section to modify the EXIF data of your photos. Once you made the changes with your photos, just click on the Run button. Here you can choose the image quality and the format for image output. That’s it. Now your photos are ready to be shared. WonderFox Photo Watermark is a simple but quite powerful software to protect your masterpiece. It costs you $29.90 for personal use and $74.90 for a business license. 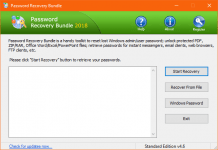 This tool works on Windows XP, Vista, Windows 7, 8 and 10. There is a problem I faced while using this software is, sometimes it lags while processing the effects. 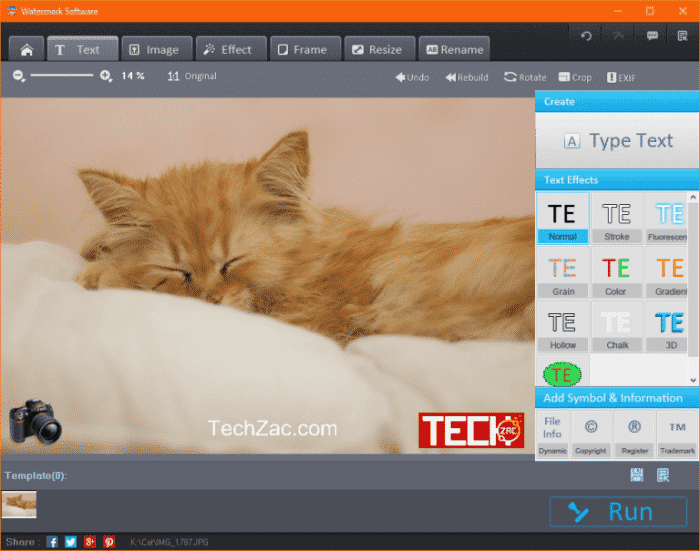 If you are doing a lot of work with the image watermarking, you should purchase this software right now. WonderFox Photo Watermark allows you to implement watermarks to the maximum and contains batch watermarking of images with zero quality loss.